I’ve got an incredible life-changing secret to share with you today! Maybe “life-changing” is pushing it, but since my life currently revolves around working 12 hour days and 7 day weeks with my eyes glued to the computer screen while my boyfriend tears our bathroom apart and leaves lots of nice pointy pieces of broken tile on the floor for me to trip over, I totally consider pancakes to be life changing. Anyway, are you ready for the secret? I’ve found out how to make those super simple 2-ingredient banana-egg pancakes not taste eggy! A little while ago I shared some 4 ingredient healthy banana egg pancakes with you guys and we talked about overly-eggy pancakes. In that recipe I got around the icky egginess by loading the pancakes up with oats. This time, instead of adding ingredients, I’ve taken one away. You know when you’re too close to a problem, you can never figure out the solution? Well that’s exactly what happened here. 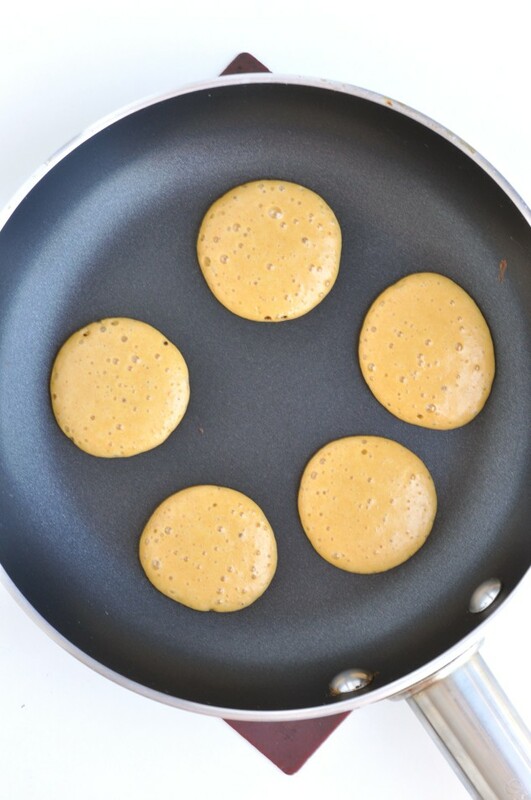 The basic recipe for healthy banana egg pancakes is to mix 1 banana and 2 eggs together then cook them in a pan. Well, you wanna to how to make those pancakes taste less eggy? Get rid of 1 of the eggs. Seriously. Beat 1 banana and 1 egg together then cook the batter in the pan. You get the same texture but none of the eggy taste. It’s so simple, yet I missed it for years! You know what else you can do to make healthy banana egg pancakes taste less eggy? Add in 2 tablespoons of a dry ingredient. 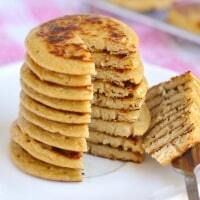 For these healthy peanut butter banana pancakes, I use PB2. If you haven’t heard of PB2, it’s a powdered peanut butter that’s had all the fat taken out of it. 2 tablespoons of ordinary peanut butter come in at around 200 calories. While 2 tablespoons of PB2 come in at just 45 calories. Plus, you can also get chocolate flavoured PB2. Score! These healthy peanut butter banana pancakes are so good I’ve been making them literally several times every week! And not just as a weekend treat – I’ve been making them on the weekdays, too. How on earth do I manage to find the time to make healthy pancakes for breakfast when I’m working 12 hour days, you ask? 1 word – NutriBullet. You know I’m not a big smoothie person (unless we’re talking gorgeous Insta-worthy smoothie bowls, then I’m all over them) so I’ve been searching for alternative uses for my NutriBullet. And I found out they’re awesome at mixing pancake batter! Just throw all the ingredients into the container (you don’t even need to chop up the banana – just break it up with your hands) whack it on for 1 minute while the pan heats up and you’ve got perfectly mixed pancake batter. It really couldn’t be easier. 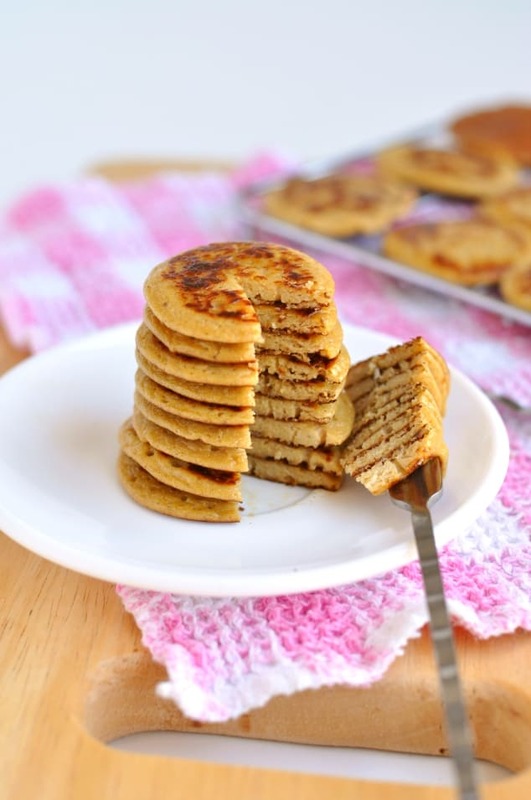 With these healthy peanut butter pancakes, you'll never have to suffer through a plate of horrible eggy pancakes ever again! 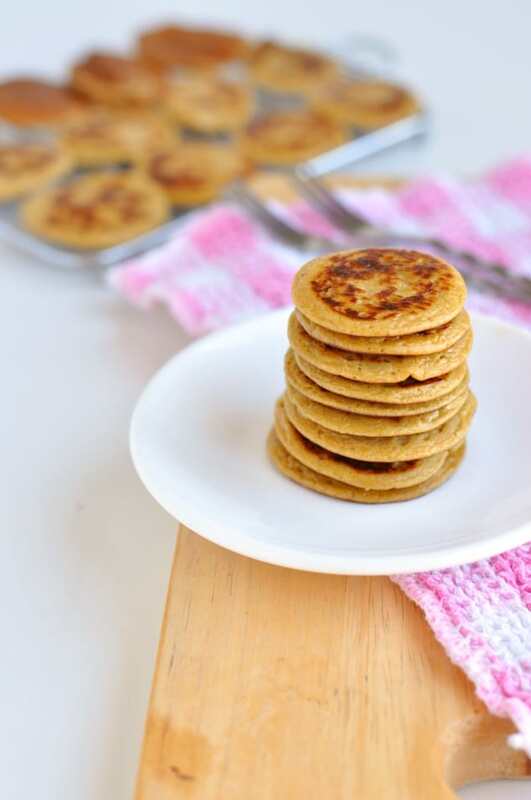 Gluten-free, dairy-free, refined sugar-free and clean eating, these healthy pancakes will be your new favourite breakfast treat and they only take 10 minutes to whip up! Place a medium-sized non-stick frying pan over a medium heat. 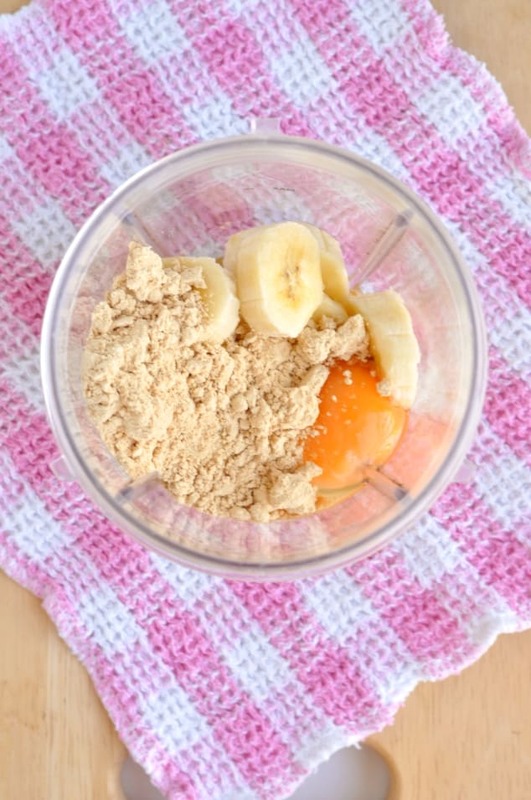 Add all the ingredients into your NutriBullet or another high-speed blender and blend for 1 minute until everything is completely broken down. Pour the pancake batter into the frying pan (you can make your pancakes as big or as small as you want) and cook for around 2 minutes, until bubbles begin to appear on the surface. Flip each of the pancakes over and cook for an additional 30 seconds on the other side, until golden brown. Serve immediately while hot.